February 7, 2019 3:30 pm. Outstanding four-year-old Danzdanzdance could not have been more impressive winning her last two starts, with Group 1 triumphs in the Captain Cook Stakes (1600m) and Zabeel Classic (2000m) effectively turned into a one act affair. But the lingering question is whether the ever-improving mare can repeat those performances on a good track, with respective conditions of Slow8 and Heavy10 the scene for those victories. 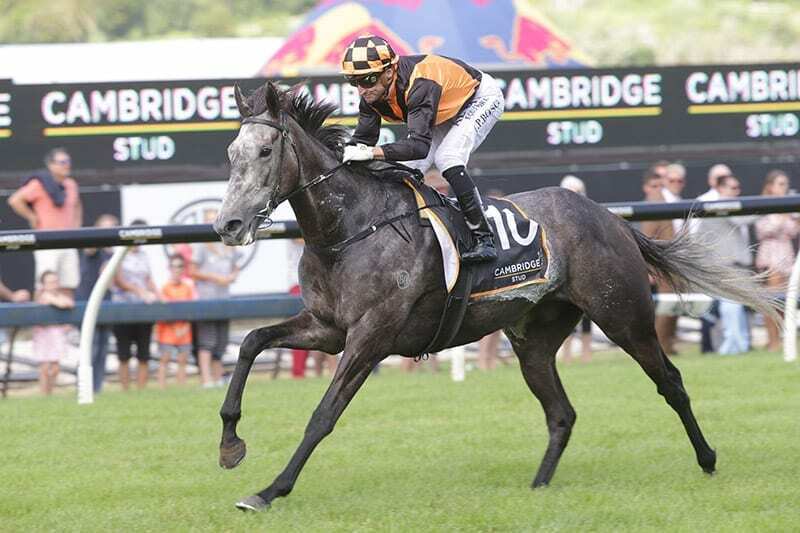 Saturday’s Group 1 Herbie Dyke Stakes (2000m) at Te Rapa will be an opportunity for the popular grey to quash any doubters, with a Good3 track to offer no excuses for her rivals. Punters have backed the daughter of Mastercraftsman into the $1.85 favourite with Australian jockey Michael Rodd set to jet in from Singapore to take the reins with Opie Bosson, who has ridden Danzdanzdance to her past two wins, suspended. “We’re really happy with our mare,” said Chris Gibbs, who trains in partnership with Michelle Bradley. Gibbs said that Danzdanzdance races well fresh and they have purposely spaced her runs this preparation. “There’s a bit of a routine that we go through where she has a few days off after her runs,” he said. “It depends on how many days in-between runs as to how long we put her out for and just how well she comes through each run. We adjust it accordingly. The Ruakaka conditioner said they had made use of syndicator and part-owner Kylie Bax’ property in Cambridge for a bit of down-time for the mare when they had travelled Danzdanzdance for assignments in Hawke’s Bay and at Trentham. Gibbs said that he did not expect Danzdanzdance to be ridden in a similar manner to her last start victory in the Zabeel Classic, where she raced at the tail of the field before looping her rivals to win by three and a half lengths under a hold. “I don’t think she will get back anywhere near as far as she did last time. That was totally unexpected,” Gibbs said. “You can get away with that on a slower track, but I don’t think we would want to get back there on a better track anyway. You can’t set yourself that sort of task. “From barrier five, I’d like to think Michael (Rodd) might be midfield, maybe three-back and one-out. Gibbs also thought the $1.85 odds were prohibitive. “I understand why she is at those sort of odds, but I wouldn’t be backing her at those odds,” he said. “There is a bit of doubt over the track and it is a bit of a different beast really. There are a couple of new horses coming into it, including a three-year-old (Madison County). We won the race with a three-year-old in Valley Girl a few years ago, so it can be done against good horses. “You have to show respect for everyone that is in there, but we’re happy with our mare.” Gibbs said the mare is proving popular amongst the Ruakaka locals and a good performance on Saturday will see Danzdanzdance embark on a two-start Sydney Campaign. “It’s great for the area. We get a lot of comments from people I don’t know just walking down the road, they just love watching her go around and they think she is representing us up here. That is quite cool from a Northland point of view,” he said. The A$4 million Group 1 Queen Elizabeth Stakes (2000m) on April 13 is the other race on the program for Danzdanzdance.